As Tau forces clash with the armies of the Astra Militarum on the surface of the shrine world Sacaellum, ever more dangerous forces converge on the planet and join the fight. 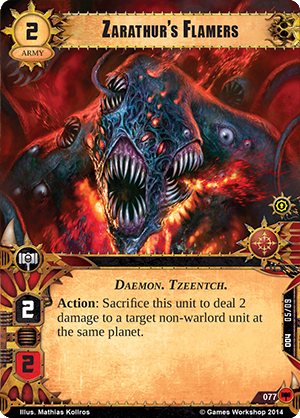 The space hulk Kaerux Erameas, filled with bloodthirsty worshippers of Khorne, has crash-landed on the planet surface even as the Dark Eldar of the Shadowed Thorns Kabal enter the carnage, intent on seizing slaves for the dark city of Commorragh. War has left a bloody path across the Traxis sector, and soon, you’ll be able to bring new focus to each planet’s type symbols with Boundless Hate, the second War Pack in the Planetfall cycle for Warhammer 40,000: Conquest. In addition to the new focus on the planet type symbols, Boundless Hate includes two new warlords—one for the forces of Chaos and one for the Dark Eldar. 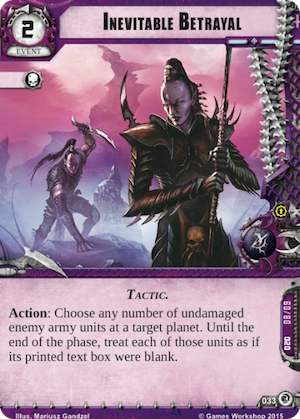 Today, you can launch your ambush with the Dark Eldar and leave pain and suffering in your wake as we preview the new Dark Eldar warlord: Archon Salaine Morn! The leader of the Dark Eldar forces on Sacaellum is none other than Archon Salaine Morn (Boundless Hate, 30), a cruel and brilliant leader. 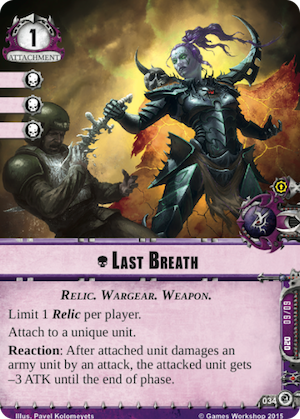 During her battles in the Traxis sector, Archon Salaine Morn’s primary objective is to claim new spoils, especially slaves from the other races. 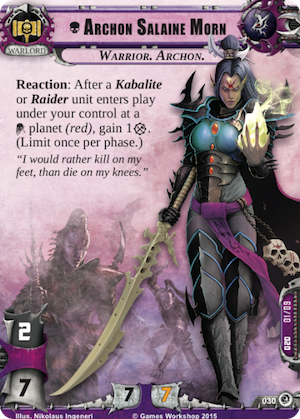 To that end, Archon Salaine Morn gives you an incentive to deploy your units at the red material planets of the Traxis sector: whenever one of your Kabalite or Raider units enters play at a material planet, you immediately gain one resource! The benefit of this ability is compounded by the fact that the available Kabalites and Raiders are among the cheapest units in the Dark Eldar armies. 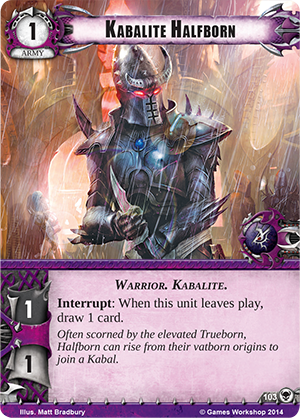 When you receive a resource back from deploying at a materiel planet, cards like the Kabalite Halfborn (The Threat Beyond, 103) become essentially free to play. Not only can you spend an action in the deployment phase to play one of these army units, you suffer no ultimate penalty to your resource total. Of course, Archon Salaine Morn’s ability is limited to once per phase, but the units introduced in her signature squad offer you the chance to use her ability even outside the deployment phase. In the archon’s signature squad, you’ll find four copies of the Shadowed Thorns Pillagers (Boundless Hate, 31). These units offer respectable combat stats with a command icon, and they bear the Ambush keyword, allowing you to play them during the combat phase. It’s inherently powerful to ambush armies into play at the end of a combat round, when your opponent has no ready attackers left, and the Shadowed Thorns Pillagers are a worthy combatant. 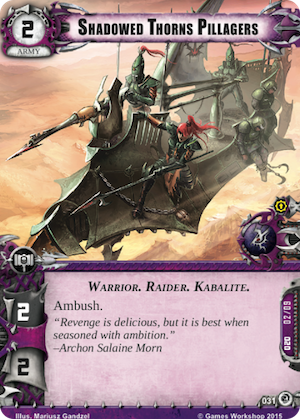 Obviously, they are also both Raiders and Kabalites, so if you ambush them onto a materiel planet, Archon Salaine Morn gives you a resource to help offset the unit’s cost. Because Archon Morn’s ability lets you gain bonus resources when you strategically deploy Raiders or Kabalites, you may be left with some disparity between your number of resources and your cards in hand. Fortunately, you can reconcile this with The Nexus of Shadows (Boundless Hate, 32). This support offers a simple, but powerful, ability—as an Action, you can spend two resources to draw a card. The versatility offered by this ability is immense. You may draw a card in the deployment phase, searching for more units to play (and spending a deployment action), or you may trigger The Nexus of Shadows during combat if you desperately need an additional shield card to change the tide of battle. 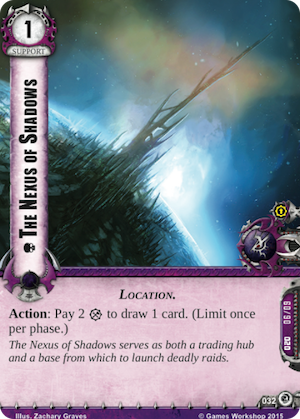 No matter how you use it, The Nexus of Shadows is a valuable addition to this signature squad. 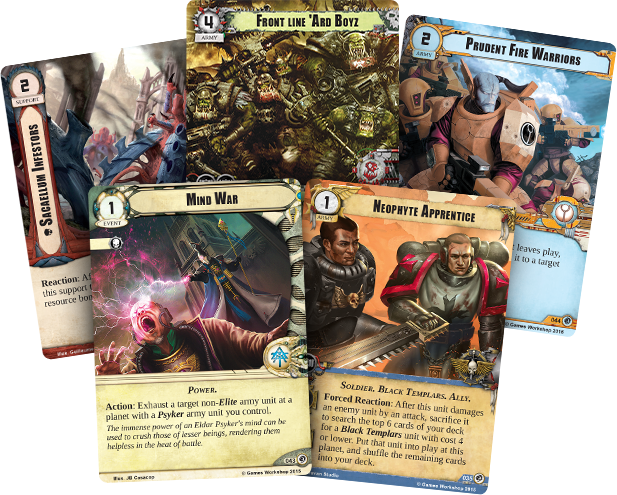 Gaining additional resources and cards or surprising your opponent with an ambush are great ways to increase your odds in battle, but to win battles, you ultimately need ways to answer the troublesome army units your opponent has on the board. If certain units feature powerful abilities to destroy your units, such as the Area Effect keyword, you gain an answer with Inevitable Betrayal (Boundless Hate, 33). By playing this event, you can choose any number of undamaged enemy army units at a planet. Then, until the end of the phase, each of those units is treated as if its text box were blank! Whether you’re neutralizing an Honored Librarian (Core Set, 14) or Zarathur's Flamers (Core Set, 77), Inevitable Betrayal is an invaluable tool in your arsenal. Finally, you may choose to equip Archon Salaine Morn with her legendary blade, Last Breath (Boundless Hate, 34). This ancient weapon can completely neutralize enemy units for the rest of the combat phase: whenever the attached unit damages an army unit with an attack, the damaged unit suffers from an ATK reduced by three for the rest of the phase! If effect, wielding Last Breath can make your opponent’s attacks meaningless, weakening his units and forcing them to strike for no damage. In the hands of a master warrior, this Relic can easily turn the tide of a battle in your favor. Whether you embrace the bloodlust of Khorne and charge into battle or orchestrate a cunning raid with a Dark Eldar archon, you’ll be able to lead your forces into battle with the new warlords introduced in Boundless Hate. Pre-order your copy of Boundless Hate at your local retailer today! 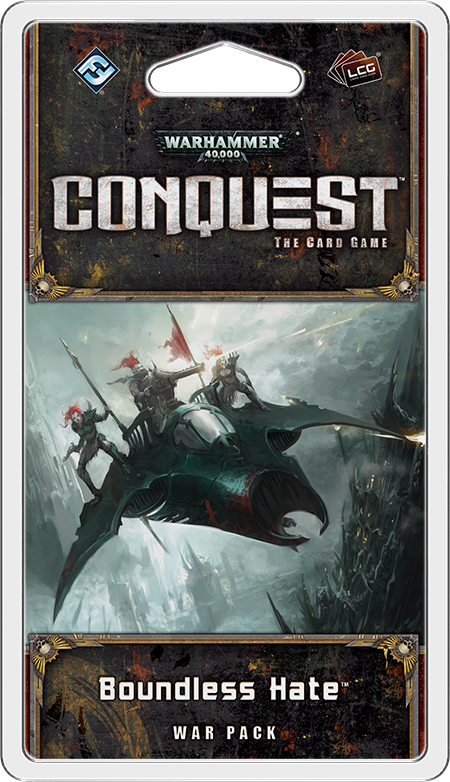 Warhammer 40,000: Conquest is a two-player Living Card Game® of interplanetary warfare in the gritty futuristic setting of Warhammer 40,000. 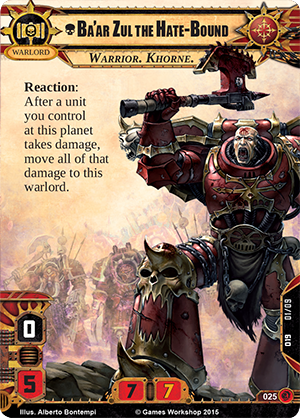 By hurling you into a life-and-death combat for the Traxis sector, Warhammer 40,000: Conquest forces you to secure your hold over the sector’s key planets. You must balance the concerns of present battles and future conquests as your warlord leads your armies to glorious victory. To claim the Traxis sector, you must conquer or die. 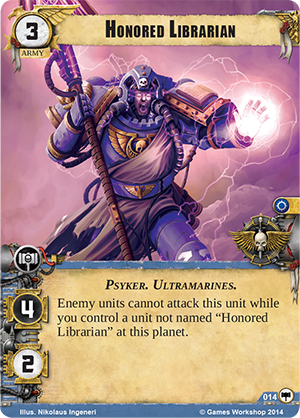 Warhammer 40,000: Conquest: Boundless Hate © Copyright Games Workshop Limited 2015. Conquest, the Conquest logo, GW, Games Workshop, Space Marine, 40K, Warhammer, Warhammer 40,000, 40,000, the ‘Aquila’ Double- Headed Eagle logo, and all associated logos, illustrations, images, names, creatures, races, vehicles, locations, weapons, characters, and distinctive likenesses thereof, are either ® or TM, and/or © Games Workshop Limited, variably registered around the world, and used under license. See the prizes you could earn at the 2016 World Championships!